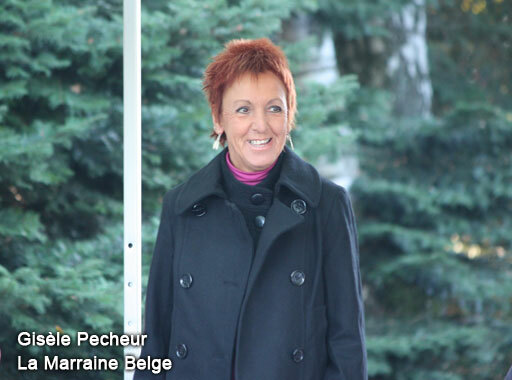 The choice of the family Mc Keen was easy: May 2nd, 2006, Robert Remacle and his wife, Gisele Pecheur, had asked to be the godparents of a U.S. soldier killed in the perimeter of Bastogne. 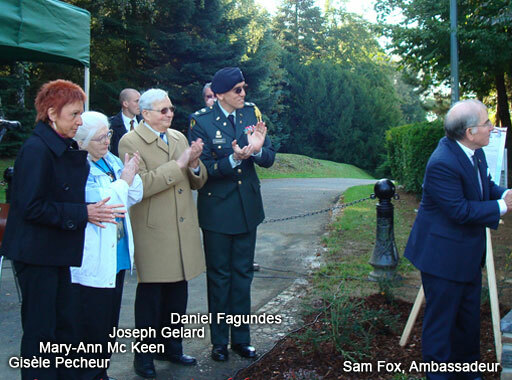 Mr. Hoocker as well as Mr. Joris of the American Cemetery Neupré have entrusted them with the memory of Dennis Mc Keen, a very young U.S. soldier, married and father of a little Mary-Ann who was born six weeks after the departure of her father for the Europe ... Specifically to Belgium. 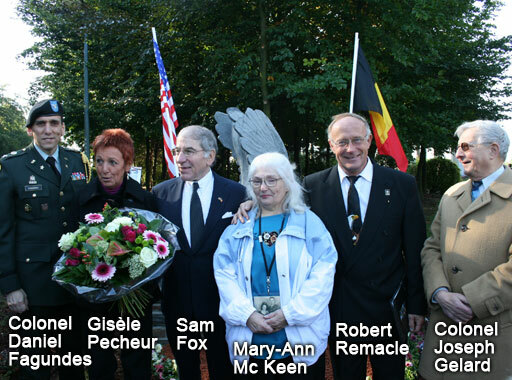 When the mayor of Bastogne Philippe Collard came to see the statue which was almost finished, Mr. Remacle asked to have an American godmother and godfather, but also a Belgian godmother and godfather. 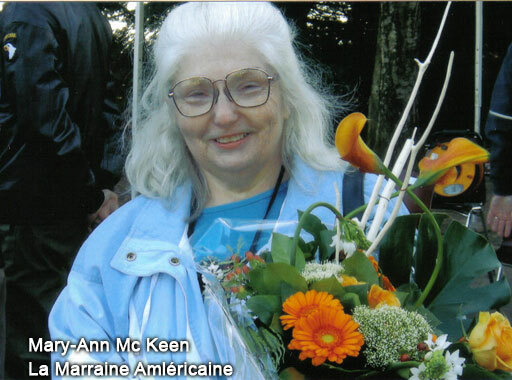 Mary-Ann McKeen as American godmother, and his Wife ,Gisèle Pecheur, (daughter of a POW), who had to endure all his absences and continuously clean his work clothes, as Belgian godmother. Philippe Collard, immediately, approved the choice. 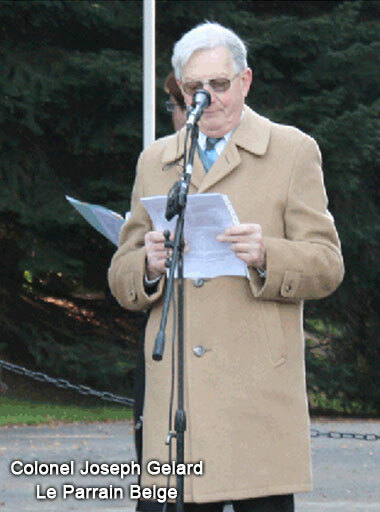 As Belgian godfather, Roby Clam, initially approached , preferred to leave this privilege to Joseph Gelard, retirred Lieutenant-Colonel of Staff , who had just received the title of Freeman from the City of Bastogne for his services as president of the 60th Anniversary Committee. As American Godfather, we wanted to get the son of a GI who had died in Bastogne and belonged to an unit under the orders of the 101st Airborne, for example the 10th Armored, through the U.S. Embassy in Brussels and with the assistance of authorities of American cemeteries in Neupre and in Henri-Chapelle, the Belgian Embassy in Washington created a special website to find this godfather. Having received no response in time, HE the U.S. 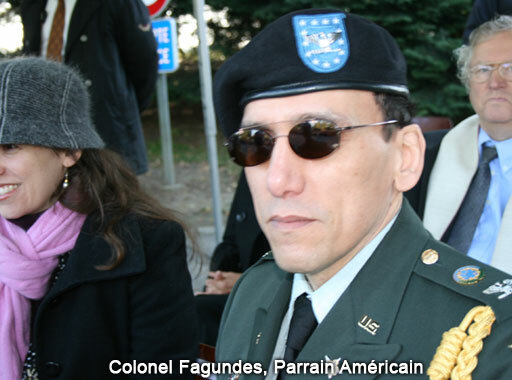 Ambassador in Brussels appointed in his staff, Colonel Daniel Fagundes as American godfather of the statue. The eaglemonument.be website has been made voluntarily in order to honor the work of Mr. Robert Remacle in memory of the American soldiers who fought during WWII.